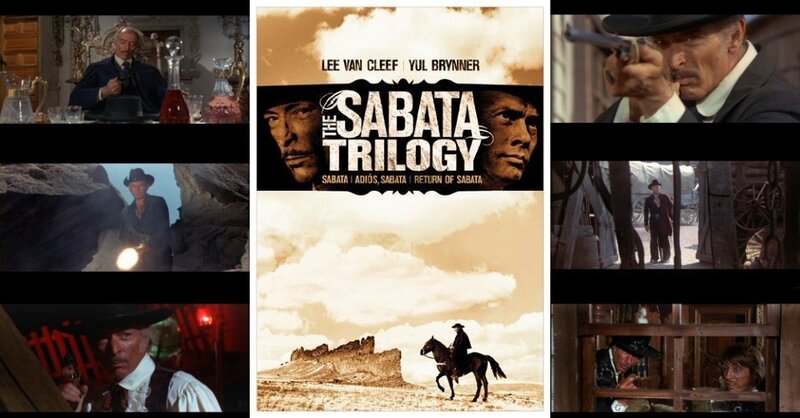 3 film, 3 disc collection of the Sabata series of Spaghetti Westerns. Song/MGM R1 USA boxset. Of all the Spaghetti West's gun toting anti-heros, Sabata is one of the least known. With just six title-role films, and a couple of cameos, he is hardly an equal to the likes of Django or Sartana. But the three films included here are all fun and entertaining, chock-full of clever tricks and action packed finalés. Although never reaching the peak of some of the other 1960 euro-Westerns, this set is recommended for fans looking for a less intense visit to the Old West. The boxset provides impressive, original scope widescreen and fully uncut prints of the three Alberto Grimaldi produced Sabata films. Although the lack of extras is not surprising considering that most of the lead cast are no longer alive to be interviewed, and the set does retail for a budget price, the lack of original trailers (apparently on the Japanese DVDs) is rather disappointing. The Films - links to individual DVD reviews. Anyone famous in it? Features famous Western stars Lee Van Cleef and Yul Brunner. Anyone looking for a fun, entertaining film should enjoy this. Spaghetti Western fans will certainly find this a break from the more intense genre entries. Visuals All films are in Original Aspect Ratios (2.35:1) and Anamorphically Enhanced. The picture quality is strong throughout. Audio All discs have original English Dolby Digital mono and French dubs. English track is generally strong. Subtitles French and English subtitles for all films. Extras All the discs include the same trailer reel for other MGM/Sony Westerns. Packing Plastic slipcase includes three thin-pak cases. Single disc releases are due on 22nd May 2007 from MGM/Fox. Details unconfirmed at present. Other regions? Some films have releases in other countries. None particularly superior. Cuts? All films are believed to be fully uncut. Prints are English langauge. A mix of entertaining and action packed Western action although don't expect too much in the way of plot. A great looking set of prints with good audio. Lack of original trailers is a disappointment. All text in this review written by Timothy Young - Feb. 2006.